GREEN BAY — The Packers remained undefeated, 6-0, with a 27-20 win over the Chargers on Sunday. Guard T.J. Lang might have preserved the Packers’ undefeated season by recovering an Eddie Lacy fumble deep in Packers territory, after the Chargers had cut the Packers’ lead to 24-20. After an exchange of punts, the Packers took possession at their 20-yard line, needing to kill 6:14 remaining on the game clock. Aaron Rodgers pitched a short pass to tight end Richard Rodgers. The play gained 25 yards. A Rodgers scramble/shovel pass to Jeff Janis exploded for 33 yards to the Chargers 20, and the Packers were threatening to score the clincher. A holding call against the Chargers secondary gave the Packers a first down at the 10-yard line. With 2:46 to play, Rodgers faced a third-and-goal and threw incomplete for Richard Rodgers. Mason Crosby then booted a 27-yard field goal that gave the Packers a 7-point lead. The Chargers moved the sticks twice and were at their 43-yard line by the two-minute warning. A one-handed catch by Antonio Gates moved the ball to the Packers 39 with 1:19 to play. A short pass to Danny Woodhead moved gained 11, as Woodhead stepped out of bounds. From the 28, Rivers found Gates at the 13. 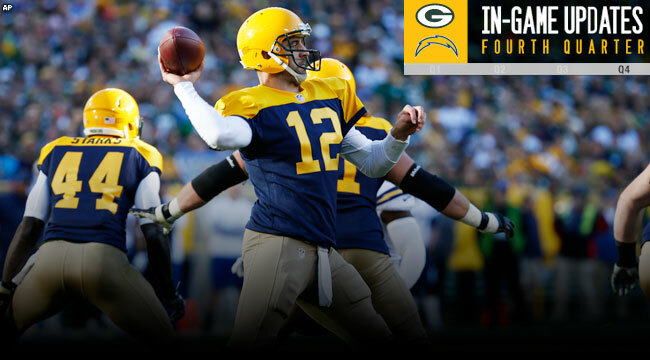 A 12-yard pass to Ladarius Green put the ball at the Packers 3-yard line, as Rivers crossed the 500-yard mark. Woodhead gained a yard and the Chargers called time out with :28 to play. Rivers threw incomplete on second and goal. Woodhead was wide open on the play. On third-and-goal Woodhead was stopped and the Chargers had one play to tie the game. Rivers’ pass was knocked away by rookie cornerback Damarious Randall. Rodgers completed 16 of 29 passes for 255 yards and two touchdowns. James Starks rushed for 112 yards on just 10 carries. Rivers posted eye-popping stats: 43 of 65 for 503 yards and two touchdowns. His favorite receiver, Keenan Allen, caught 14 passes for 157 yards, but had to leave the game in the second half with a hip injury.